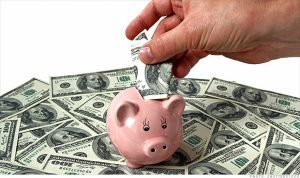 You are probably already aware of the necessity of having emergency savings on hand, but what have you actually done about it? It can be hard to find money to put into savings, especially if it seems like everything else in your budget is spoken for. With a little ingenuity and planning, you can kick-start your savings account, so that you’ll have a tidy sum put away in no time. Instead of letting your change collect in your pockets or between the seat cushions on your couch, get yourself a change jar. Get in the habit of making a “deposit” every time that you’ve got spare change. Don’t limit yourself to coins either. Paper money works too! If you find it challenging to save a little extra money every month, set up automatic savings through your lender or your employer. When savings comes right off of your paycheque, you won’t even notice it. You will, however, notice your savings balance grows more quickly as a result. Sometimes you are lucky enough to get a bonus or to come into a little extra money. Plan ahead now to save that extra money when you get it. It’s this kind of money that is outside of your regular income that can really give your savings a boost. If you really want to grow your savings, learn about different types of investments and how you can make your money work for you. Remember though that if this is to be earmarked for emergency savings, you should have it in something that is easily accessible and doesn’t fluctuate in value in the short term, like a savings account, GIC or “like cash” mutual fund. Do you belong to any rewards programs that offer cash back? Let’s say that you are buying groceries and you apply your rewards to your balance. Take that money that you saved and put it into your savings.